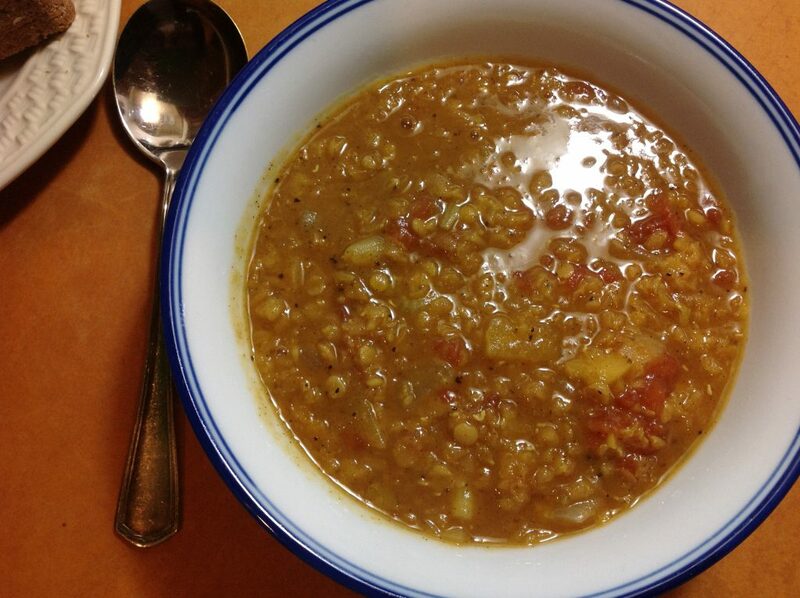 This lentil soup is loaded with disease lowering antioxidants. Factor in the power of turmeric to help reduce your chances of developing Alzheimer’s, and you have a bowl of soup that tastes too good to be good for you. Red lentils, are small and cook faster than their cousin’s green, brown, tan and black lentils, making this soup quick and easy to make. Mix together cracked black pepper, turmeric, cumin, cinnamon, and allspice in a small bowl and set aside. Heat a large pot over medium heat; add oil and onions, sauté for 5 minutes or until golden brown. Add garlic, ginger, and the spice mixture. Sauté for 1 minute. Add tomatoes, broth, water, rinsed lentils, and apricots. Bring to the boil, cover, reduce heat to simmer and cook for 35-40 minutes stirring occasionally. Serve. Can be made up to two days in advance and stored in the fridge. Lentils are in the Pulse Family and are loaded with disease fighting antioxidants, vitamins, minerals, two types of fibre: both soluble (helps to lower cholesterol and remove toxins from the body) and insoluble (helps your gastro-intestinal tract keep moving). Lentils are high in protein, low in fat, and are economical. Quite the list of pluses for this little pulse. Canada is the world’s largest exporter of lentils, with Saskatchewan leading the way as the biggest Canadian producer of this home grown nutrient dense gem. Lentils come is a range of colours: red, green, tan, brown and black. Lentils are faster to cook than their pulse cousins, dried beans, chickpeas and split peas. No need for an overnight soak, simply add them right into a recipe. Or for the ultimate in lentil convenience, open a can, rinse well and drain before you add them to a chili, soup, or casserole. My weekly menu for long term health includes adding lentils to my dinner plans at least once a week. Hi Marilyn – apricots in lentil soup? Ok girl – what’s the dish with that? I thought the soup needed a tad sweet to cut out any bitter notes from the spices.